Organizations should know about some facts before applying for any Government fund. In this video you find needful information which you must do follow before applying for any Government fund. 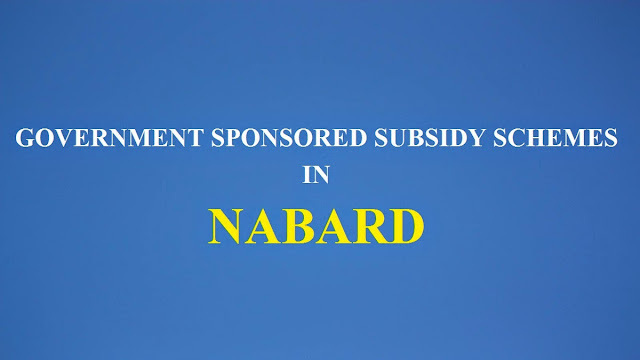 GOVERNMENT SPONSORED SUBSIDY SCHEMES IN NABARD! WHAT IS PROJECT JUSTIFICATION IN GRANT PROPOSALS? List the three main factors that are causing the problem you address. Let’s say your project is about training a group of 10 unemployed young people to edit documentaries: explain that local schools and university curricula do not provide such training, that the closest training centre is two hours away, and that there are no professional video-editors in your community. Explain why you think this project is ultimately important and for whom. Remember to clarify how through the development of this project your target group could consistently improve their skills, life expectations, or quality of life. For instance, find information about the employability of video-editors in your area. Look up, in job centres or adverts, existing trends in the market and make a strong case for these trained young people to increase their possibilities of finding the job they really want. It is important to link your project with the reality of your community. Write down how you came up with the idea by recounting facts or experiences you had that drew your attention to this problem. If possible, add other voices. For instance, and referring to the example above, if you once met a young woman who wanted to become a film-maker, but had no way of learning the basics of video-editing, briefly recall her story. In this way, the donor will get a sense of the importance of your project in the community and the extent to which its development will benefit real individuals. Once you have all these parts, take your time to create a consistent and organic narrative. Start with a simple sentence summarising the main goal of the project. Add a paragraph about the reasons at the root of this problem. 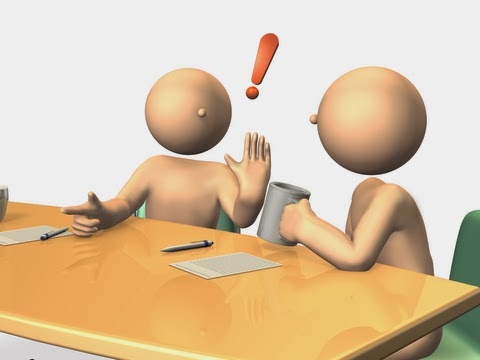 Briefly explain how is your project intervening to solve said problem. Draw on the success of similar initiatives to strengthen your own proposal and explain how this project will concretely benefit improve the life of members of your community by inserting life stories in your narrative. Remember that a successful proposal is written in a clear, simple, and engaging way. Accordingly, avoid repetition, rhetorical questions, and complex phrasing. Write simple sentences that make concrete points. This will convince the donor that your project is feasible and that it answers to specific needs of your community. Also, to set concrete goals will enable the donors to monitor the implementation process and evaluate the final results. 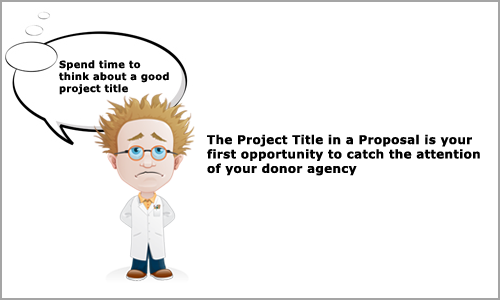 HOW TO WRITE AN ATTRACTIVE AND EFFECTIVE PROJECT TITLE FOR YOUR PROJECT PROPOSAL! Unknown BLOG, GK FOUNDATION, Glimpse Knowledge Foundation, HOW TO WRITE AN ATTRACTIVE AND EFFECTIVE PROJECT TITLE FOR YOUR PROJECT PROPOSAL. The title of a project is of ultimate importance, thus make sure to take your time to find the best one. Titles must be attractive and exciting at the same time. The title must convey the meaning, the area of intervention and the goals of the project while being enticing. It is good practice to select the final title together with all the other members of the NGO. Whereas the project proposal is very technical and requires specific skills that not everybody may possess, the title represents everybody’s efforts, expectations, and aspirations. Accordingly, all the members should be asked to participate in the process of selecting the title to make sure that they all feel excited by the idea of working towards its development. Firstly, write down on paper five key words, which summarise your project. For instance if your project will organise a communal meal in a certain neighbourhood known for its lack of social cohesion, in order to improve relationships among those living there, write: food, dinner-party, neighbourhood, community, and social cohesion. Gather all the members of your NGO for a collective brainstorming session. Write down the five words you selected on a board and ask the group at large to work with those words and suggest possible titles. It is important that you set your goal for the meeting as that of coming up with the best three title-proposals within a couple of hours. Make sure to prepare coffees and cakes for your collaborators (it is not proven that sugar helps creativity, but it will create a more relaxed atmosphere). Set aside an hour to produce a long list of titles and another hour to shortlist the best three. Keep the meeting within the 2 hours proposed to maintain concentration among the group. You could decide whether to work within smaller groups or with one big group according to the size of the NGO and group dynamics. At the end of the meeting you should have your three short listed titles. At this point, you should organise a focus group with a group of five to ten friends. Present in brief the project to the focus group and write the three final project titles on a board. Ask to the participants to choose one and to explain why they selected it. Take notes during the discussion. By the end of the focus group you should have all the information you need to make your final choice. Read through the notes you have taken and assess the information you have gathered. Write for each of the titles their strengths and weaknesses. Compare your results and take your final decision. Make sure to circulate the final title among all the members of your NGO who participated in the process to communicate the final decision. In brief, the best title will: 1) give a general idea of what the project is about 2) make you curious about the project and prompt you to read more and to participate in it 3) not be descriptive, but allusive 4) catch people’s attention because of a play of words or a reference to movies, books, popular culture etc. 5) be simple and straightforward (avoid overcomplicated titles) 6) be memorable. GOVERNMENT OF INDIA GUIDELINES FOR ASSISTING NGOS / VOLUNTARY ORGANISATIONS! Unknown BULLETIN, GK FOUNDATION, Glimpse Knowledge Foundation, GOVERNMENT OF INDIA GUIDELINES FOR ASSISTING NGOS / VOLUNTARY ORGANISATIONS. 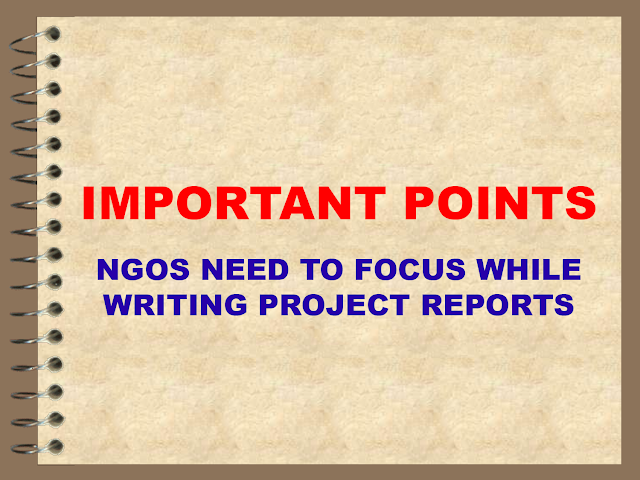 IMPORTANT POINTS NGOS NEED TO FOCUS WHILE WRITING PROJECT REPORTS! Unknown BLOG, FUNDRAISING ESSENTIALS: CREATING THE PERFECT FUNDRAISING MIX FOR YOUR NGO, GK FOUNDATION, Glimpse Knowledge Foundation, IMPORTANT POINTS NGOS NEED TO FOCUS WHILE WRITING PROJECT REPORTS! 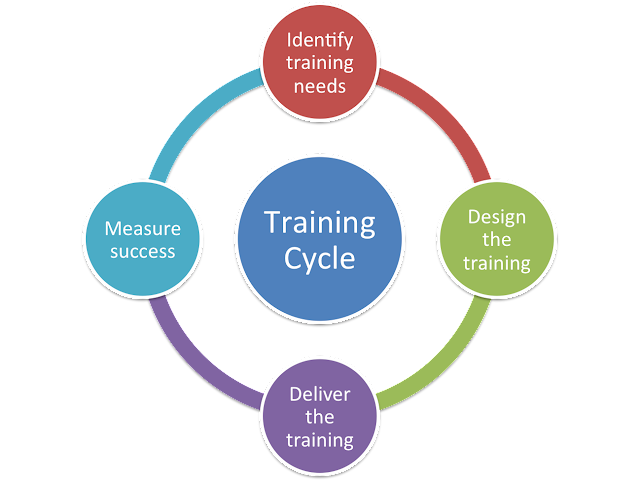 HOW NGOS CAN ORGANIZE EFFECTIVE TRAINING PROGRAMMES!!! Capacity building is an important component of human resource development in an organization. By developing the capacities of human resources, the organizations as well as the employees make progress. However capacity building is not as simple as it appears at first instance. It demands a systematic planning much ahead of the actual training starts. Especially in the backdrop of the kind of work we the NGOs are involved with and the resources we have, it becomes all the more important to adopt a systematic approach towards capacity building or training so that the desired results may be achieved. Given the importance of capacity building, many of the projects also do involve the component of capacity building these days. In such cases we think of training as just a project activity and most of the time get entangled in hardware aspects as making logistic arrangements, engaging a trainer or facilitator etc. and do not focus on software aspect which is the soul of bringing the social change we are aiming at. First of all we need to know the gap areas where the training is needed. To identify these gaps a systematic analysis is required. This involves finding answers to questions whether training is actually needed or which are the areas that need an improvement through training. There are several methods which may be used for training need assessment such as questionnaires or focused group discussions etc. Based on the target group we should choose the method for need assessment. Once training needs get identified, we need to set the objective of our training programme to fulfill these needs. Based on the need areas and objectives, we need to finalize the contents of the training as what we are going to make participants learn in the training programme. Based on your design, develop a module for the whole training programme. The module should include each and every step of each and every session you are taking up in the training. In short it should have a session by session description of how to proceed. It will guide as how to move a session smoothly. Try to include the basic reference material also in your module or refer to other available references for a fuller understanding of the topic you are going to take up. Do not forget to discuss the module with other trainers or facilitators if you are engaging someone else for the training. This will make the sessions go smoother and will also wash of confusions earlier. Finishing the above tasks you may proceed with the organizing training programme as per your training module. Evaluation of training is very important to measure whether the objectives of training are fulfilled. Hence do not forget to evaluate your training programme. You may go for the mid-term evaluation if it’s a long term training programme to judge whether it’s going in the right direction and mend it if required. A participatory evaluation is always more beneficial.